INDIANAPOLIS — This week is Work Zone Awareness week in the state of Indiana, coinciding with the national designation. The goal of this annual week-long event is to instruct drivers on safe driving practices in work zones. Fifteen cones lined the plaza of the Indiana Government Center Tuesday, representing the 15 people killed in work zone crashes in the state of Indiana in 2018. What might be more shocking is that of those deaths, only one was a worker. The other 14 were drivers passing through. 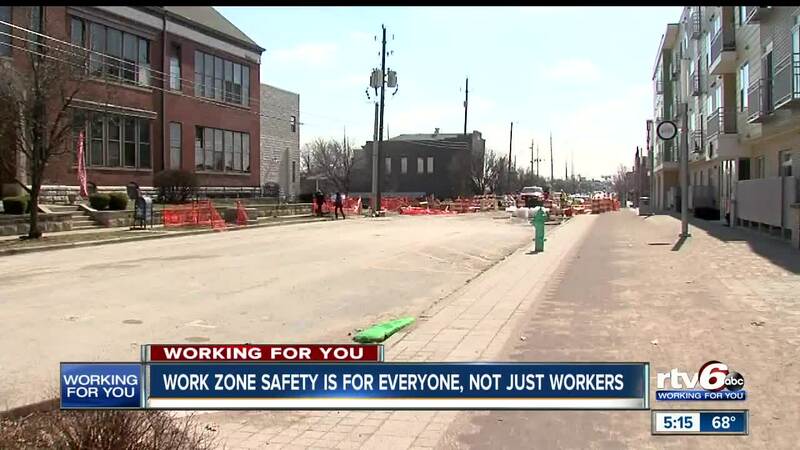 Officials with the Indiana State Police and The Indiana Department of Transportation want you to know that work zone safety is for everyone, not just the workers. “Our slogan this year is ‘Drive like you work here.' So, we don't go flying through your work. We just want people to be aware that this is where they work, they have families too, and they expect every morning when they get up, that they're going to return home as well,” Mallory Duncan, who works with INDOT’s Greenfield District, said. Safe practices for work zone driving include slowing down, paying attention to the road (i.e. putting down your phone), increasing your distance between the car in front of you and safe lane movements. Take it from Sergeant John Perrine with Indiana State Police: "The life you save might be your own." Work Zone Awareness week continues through Friday. Everyone is encouraged to wear orange on Wednesday to help raise awareness.